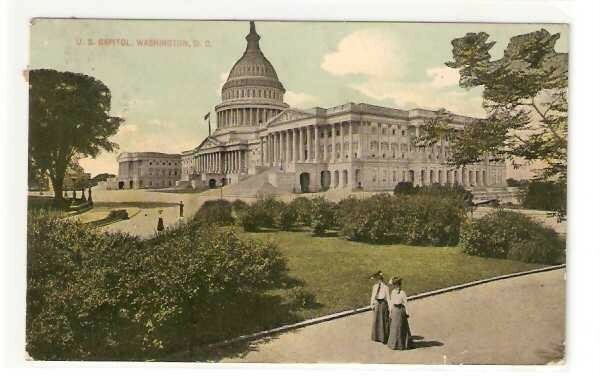 Monday, June 9, 1913: Our dear Ruthie left this morning for Washington DC. Wonder what I will do without. She won’t be home for a week at least. I surely will be lonely while she’s gone. Am fixing my last summer’s white dress. It got too tight around the waist. Isn’t that a calamity? Even today, trips to Washington, DC are often considered really special trips. I wonder why Grandma’s sister Ruth went to DC. Was it a holiday trip with friends?
. . . Or maybe the trip was work related. Ruth was a teacher at a one-room school house—maybe teachers were able to take trips to DC for professional development reasons. In any case, Grandma sounds bummed. Is she most concerned about the extra work she’d have to do (there were definitely more cows to milk twice a day without Ruth, and probably lots of other additional chores). . . or about being lonely without a sister to talk with? And, any day is a bad day when you realize you’ve gained a few pounds. Posted on June 9, 2013 September 2, 2015 by SherylPosted in OtherTagged 1913, family history, genealogy. Previous Previous post: Which Margaret Does the Diary Entry Refer to? With all the work with the cows and milking and other chores, it is surprising Helena put on weight. Yes, those extra pounds are indeed “a calamity”! Although I’ve never used that expression, it certainly is appropriate. I wonder what Ruthie was doing in Washington… Did they do things like professional development back then? Did she have a suitor? It’s fun to see the dynamics of the sisters’ relationship through the lens of what Grandma wrote in the diary. A tough day all around. Your grandma and Ruth must have been good friends (most of the time), with maybe a tinge of jealousy? And gaining a few pounds too, especially when waists were supposed to be tiny, must have been a calamity indeed. Your comment is a good reminder about how this was still the era when tiny waists were highly valued. I’ve seen a few articles in magazines about the dangers of corsets–and I think times were slowly changing; but that said, the magazines were filled with corset ads and women were obviously trying to achieve tiny waists via diet and other means. Your grandma used “our dear Ruthie” instead of Rufus. My, my, the sibling love, Helena loved Ruth. Great comment–I hadn’t thought about the significance of the name she used for Ruth until I read it. Maybe she took some students with her? They still go to DC here every 8th grade class! I hadn’t thought about it, but you might be right. The one-room school houses were grades 1-8. And, I think that it was a big deal when someone graduated from 8th grade back then since this was the end of their education for many students. Itmake sense that the recently graduated 8th graders might have gone on a trip to DC with their former teacher. Sad to think that our obsession with slenderness was bothering Helena a hundred years ago. I agree! It’s interesting from a historic perspective that women have been worrying about their weight for at least a hundred years. I think she misses her sister and she probably feels a bit down because she would love to go along. Yes, she probably was a bit jealous that she’s home on the farm while her sister got to take a fun trip. I like how she described her larger waist as a calamity. 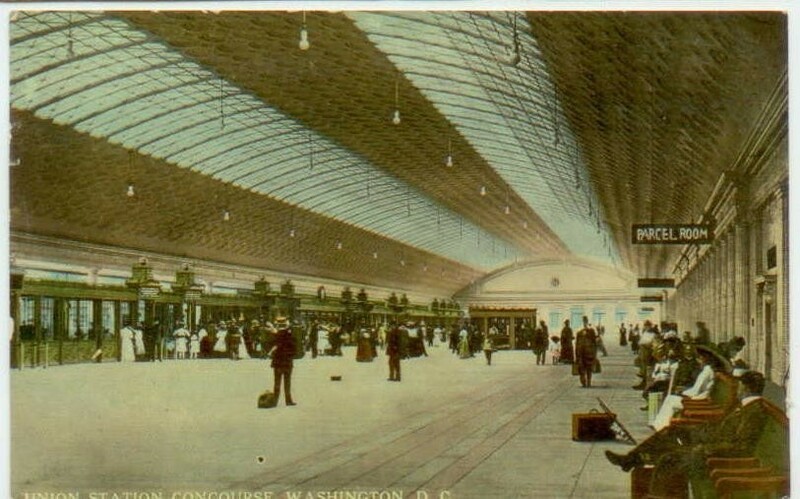 Old postcards are so much fun! Oh how fabulous, I wonder how she got there? By train all the way? Sounds like a cool adventure for 1913. I’d guess that she took the train the entire way, but am not sure. I think that there was pretty good rail transportation from central Pennsylvania to cities in the region a hundred years ago.